Traveling with a baby is something that when we found out we were having a baby we knew we would be conquering. We knew travel would forever look different, even with pregnancy it was different, but traveling with a baby is an all new adventure. 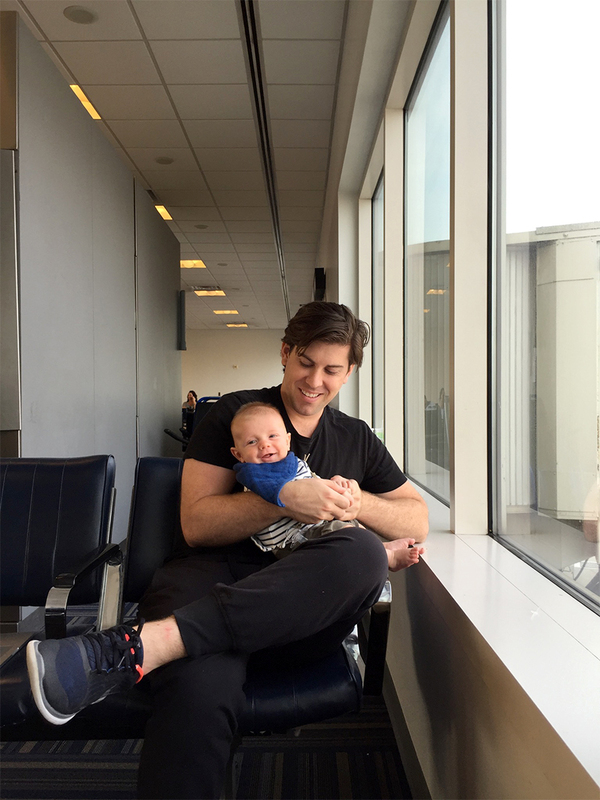 Traveling with a baby is a new journey we are willing to embrace not just for ourselves, but for him as well. We strongly feel that travel helps to build empathy for others, resilience, and a greater world-view whether you travel 2 hours from home or across the world. It can humble you in ways nothing else can. No matter what, travel grows who you are. 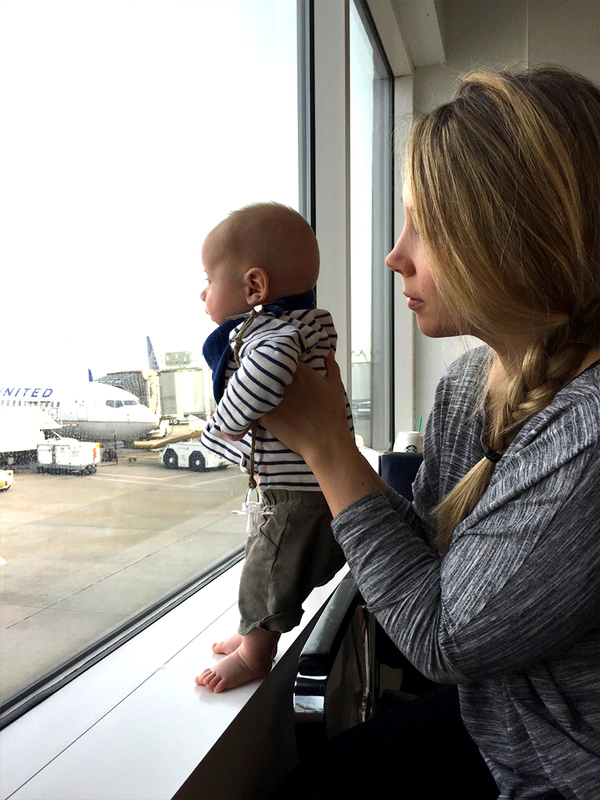 We knew we would need to start early if we wanted to continue to make traveling as a family part of our lifestyle. We saw a gap in our schedule and felt confident that we could take the adventure on so we booked tickets to head to Texas to see Mike’s family before we headed to spend a few months up north in Michigan. Hayes hadn’t met his great-grandparents yet, and we felt it would be very special to spend Mother’s Day with all four generations, so we found a direct flight and took the plunge. 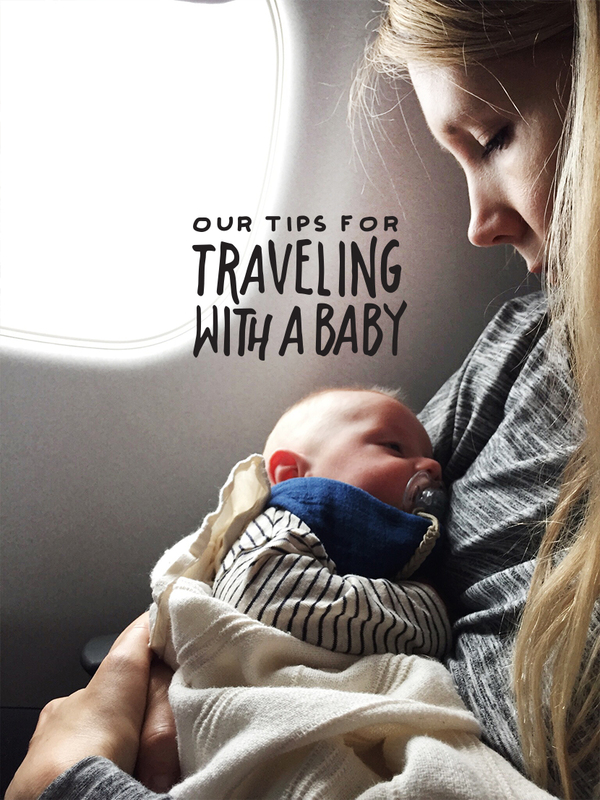 There is no doubt, travel with a kid is different, but traveling with a baby may be even more different. 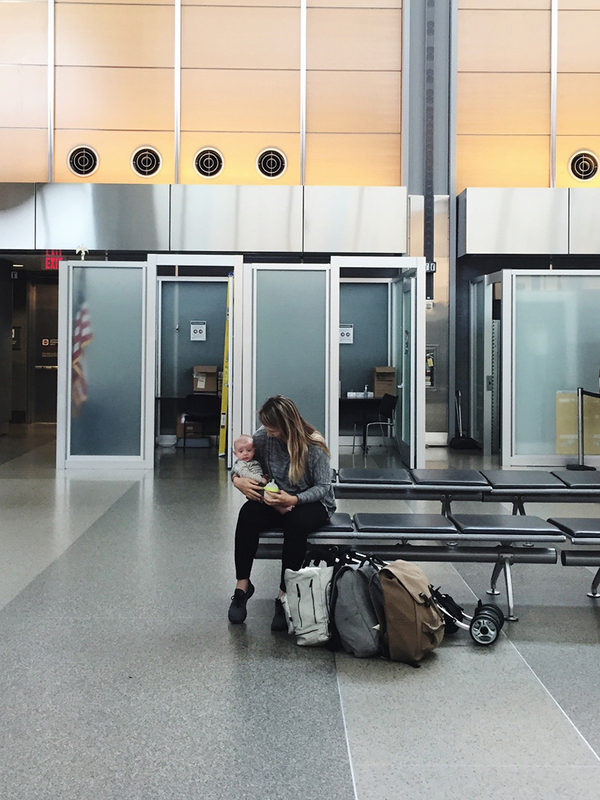 We have always been carry on only kind of travelers, and when we thought about packing for our first trip with Hayes we kept saying, “how is it that something so small needs so much? !” It was absolutely true, though. The above image doesn’t include my backpack, Hayes’s changing bag, Hayes himself, and the stroller. It was quite an undertaking to prep for the trip. In retrospect, I think I could have packed a little bit more strategically, and there were a few things we didn’t need. For the post, I wanted to cover the key items we took beyond the clothes, and expected things. I am also going to give you tips for how to pack those bags. Bed/Bassinet: We have a travel bassinet which didn’t end up fitting in ANY of our suitcases, so we took his real bassinet because it was smaller and broke down flat. You may consider bringing your playard, which we considered, but Hayes is still pretty small and we wanted him to sleep in something he knew. If you choose to do this, I suggest packing it well with soft clothing to protect it. Travel documents: Always check with your airline, but you shouldn’t need any documentation for a child under 18 years of age traveling with you within the US. If you travel internationally, you will need a passport for them. I had to do a little research to really figure out what we needed. Thus, why I am adding this here. Stroller: In all honesty we barely used it for Hayes in the airport, BUT it did tote our luggage around really well. 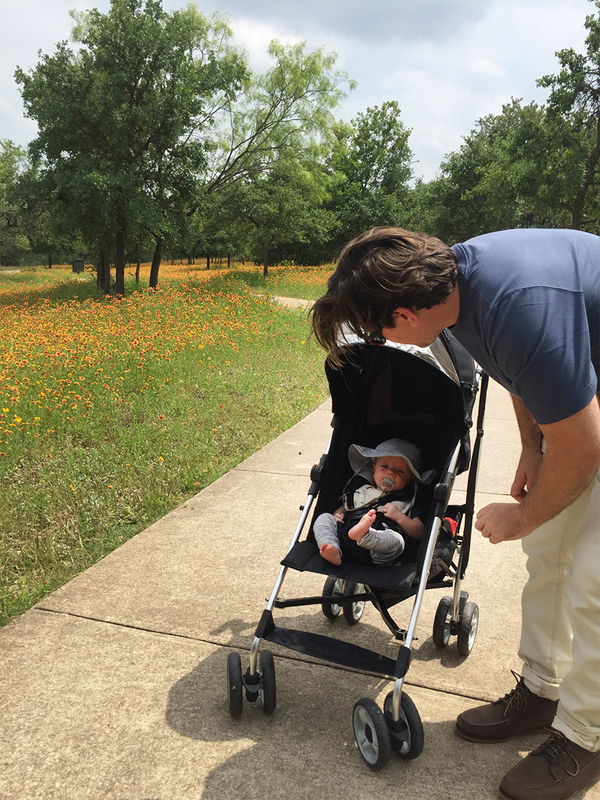 We opted for a smaller compact lightweight stroller we didn’t care about getting damaged. We love our Nuna too much to see it destroyed at baggage claim. Baby Food: No matter how you are feeding that little one make sure you have all the tools to do it and they are accessible. Pack as though your checked luggage could get lost for a couple of days. Which has happened. Baby Monitor: We have a small home and don’t need a monitor when we are home because we can easily hear him. When traveling we were staying in hotel rooms, airbnbs, and at Mike’s parents home. This meant that we would be in larger spaces we couldn’t be within a few steps of him when he was sleeping so we picked up a really basic monitor. We actually love it and think it is worth the price. More Clothes than you expect: Baby clothes are little so bring a few extras. We went through so many changes I was happy we were with family, so we had somewhere to wash them. Explosions happened more than ever while traveling either by car or plane. Also, Hayes is teething and is a complete drool fest, so we have sopping shirts all the time. Rent one from your rental car company: I would mark this one as last resort. Check your car seat at check-in: pack it well and most airlines will let you check this for free. Gate check it: if you have a travel system you can check both things free at the gate just know the protection will be a lot less because you won’t get to pack it. If you aren’t worried about a damaged stroller, this is the best option because little one can cruise in something familiar the whole time. Take the car seat on the plane and purchase a seat: if you don’t want to have a lap infant the whole time you may want to buy a ticket and have the car seat in the seat. I heard a lot of good things about this option, but you do have to pay for a third seat. A comfy blanket that they are familiar with: I wrapped Hayes on the plane in a blanket we use all the time at home, and he fell asleep nearly instantly on the plane. We used it in his stroller and everywhere we went. It seemed to help keep things familiar for him. Fabric refresher: sounds so strange, but keeping smells familiar is really important. Since we use a detergent from The Laundress, I just bought the matching scent fabric refresher with us. Every new place we went and slept (a total of 3 places) I would spritz it to help him feel comfortable there. Plus it smells amazing, so mama is happy too. Night time routine items: we brought our Puj tub (folds flat), Puj Towel, bath soap, our iPad that we use for his ocean waves sound machine (we are working on raising a surfer), and his swaddles. Keeping a routine is massively important, so try to keep all the pieces in line and with you. Those are just the basic items. 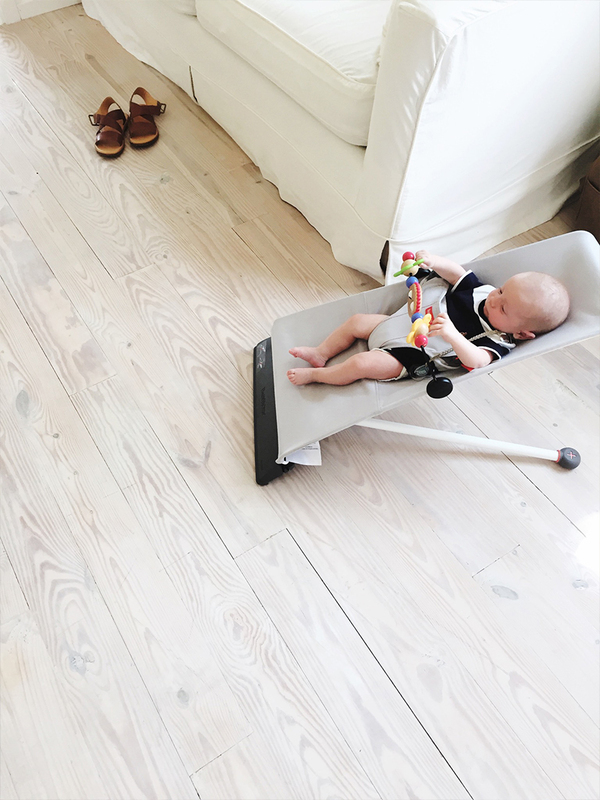 We brought his FAVORITE bouncer as well because it folded down completely flat and compact with his bassinet and weighed near nothing (seriously check this one out from Baby Bjorn! Hayes approves.) We also brought his carrier, but we honestly never used it. I wouldn’t take it in the future for a trip such as this. I forgot we even had it. We will take it to Michigan because we will be hiking and so on. In this bag, we placed EVERYTHING baby. We could have just used our clothes as padding in this bag, but I think you should still dedicate one bag to the baby even if you add in your stuff to it. In this bag, we placed all the above things (other than the stroller) as well as a pump, bottles, and so on. Make sure you have a tag on this bag and it looks unique. You don’t want to lose this bag or have it be damaged so make sure you prep for that ahead of time. In our bags, we carried our work things and then an extra set of clothing for each of us. Things happen, and you don’t want to walk around most of the day with spit-up or anything else you can imagine all over you… am I right? We never needed these things while flying but I am convinced it was because we had them on us. Also, make sure you have extra water for yourself. If you are breastfeeding the plane is very dehydrating so make sure to drink an extra 36-60 ounces of water for yourself. Bottle: On the way there I brought a bottle. You can go through security with it, just let them know. Hayes had been finicky the last week and I didn’t want to be in a desperate situation with a hungry baby refusing me on a 3-hour flight. Bib: This is mostly cause Hayes is a drooler right now. I always have an extra on hand. Wipes: I suggest getting a travel dispenser of some kind, which you most likely already have but if you don’t do it! Diapers: Have plenty whether disposable or cloth. Have what you need and about 10% extra. Better more than without is my motto. Teething Tablets: I brought them just in case because I didn’t want to take a chance he would be miserable. Pacifier and tether: We had about 4 pacifiers in our bag with covers on them. We had one tether. I liked the covers because they kept it clean if it wasn’t in his mouth, which made me feel better in an airport and plane. Hand sanitizer: I love the ones from Honest Company. With a teething baby who wanted my hands in his mouth I didn’t want to think about germs and so the sanitizer made me feel better and it was liberally applied while traveling. Though we aren’t germ freaks at home the airport always freaks me out. I put Hayes in a shirt and shorts. I think you could also put them in a simple onesie like this one as well. The reason I say this is because you most likely will change that little one publicly and in an inconvenient way. If you have a wiggler like us, the fewer snaps and finagling you need to do with them the better especially on a bumpy flight. Keep it simple. Doesn’t mean you cannot keep them cute though 🙂 I put hayes in this shirt and these shorts (though more like capris on his short legs…poor guy got my long torso and short legs). Think comfy and athleisure. I wore this top from Hatch. What I love about it is that is comfy and loose but still stylish. The flow of it acts as a great nursing cover as well, which is nice for feeding. I then wore a favorite pair of leggings with my Roshe Runs. Keeping things all black keeps stains away too. Comfy shoes are important because I spent a good 30 minutes walking around with Hayes in the stroller while waiting for our flight to keep him busy and happy. Dads should take a similar approach to being comfy, wearing black, and keeping it simple. The last thing you want is for you to get hit with a massive stain on a favorite shirt on a plane. 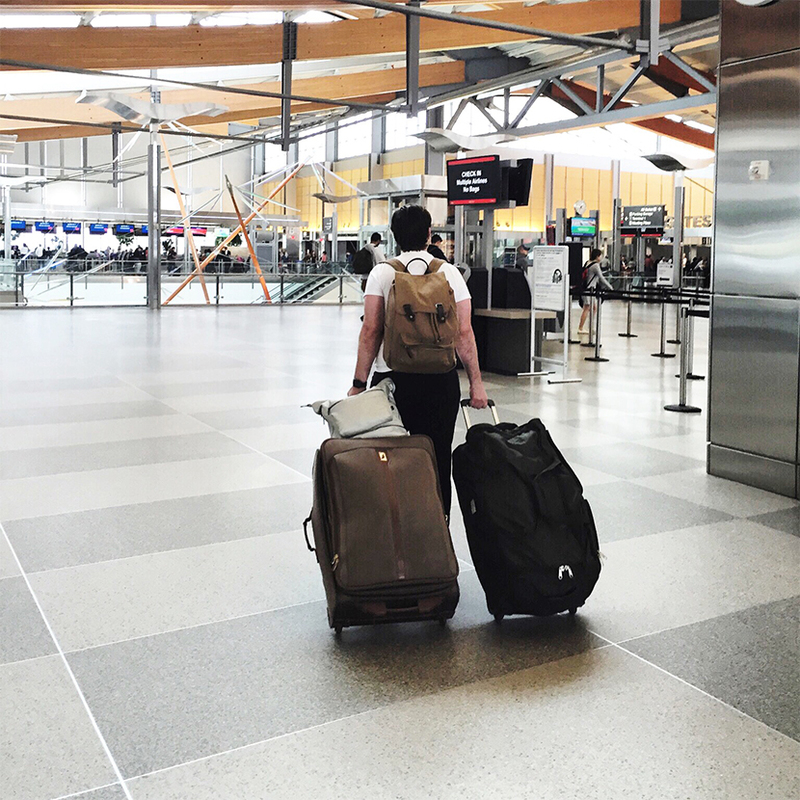 Mike wore his favorite airport pants and his go-to black crew. He also opted for a pair of Nike’s. Get TSA Prechecked. This is the best $82 you will ever spend. For domestic flights only, you can skip the normal TSA strip-search lines and go to the super fast, no shoe removing, laptop stays in bag line. This is a greater airport luxury and nearly essential with a baby. They are so helpful and nice when going through the line too. Highly suggest doing this. It does take about a month or so to get your approval, but if you have time to plan ahead go for it. Change the diaper 10 minutes before boarding. 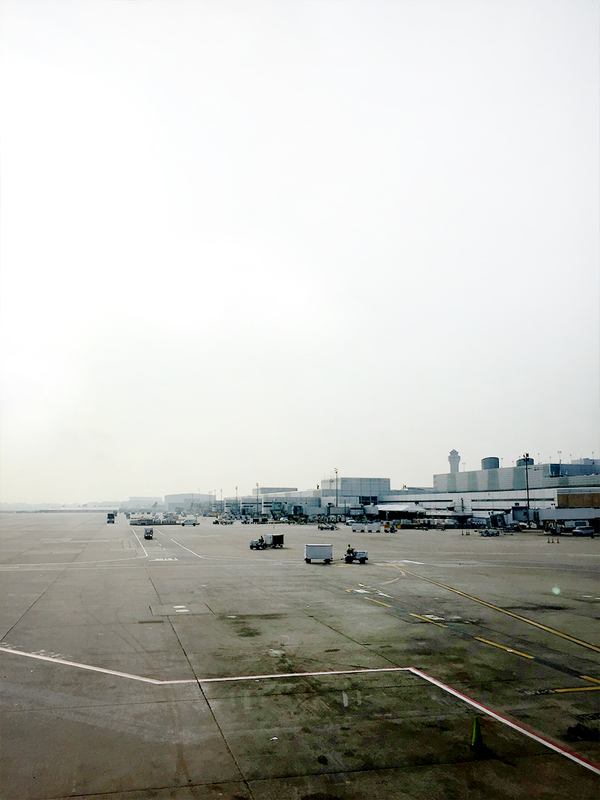 Longer flights you may have to change anyways, but better to start fresh. I asked the attendant at the desk when they would board families with babies. She gave me a time and we changed him just before. Do not overfeed before the flight. You want to time the feeding thing so they want to eat during the take-off and landing long enough that they can adjust their ears. If you by chance cannot get them to eat, the pacifier will help create the proper back suction to help their ears as well. Don’t be ashamed to lap change on the flight. I am so weirded out by airplane bathrooms for myself, then add taking a baby in there. Mike and I double teamed on the baby change and it worked just great. If you have a boy, these work great to stop a surprise spray. The biggest and most important thing is to relax. I tried not to overthink things and just go with it. I figured the calmer we were about everything the calmer Hayes would be. Sure enough, the kid passed out and only fussed once when he had a dirty diaper. Many people sitting around us had no idea we even had a baby. Once you get to your destination it is really key to make the baby a priority when getting settled. Find a way to get their stuff set up and ready for a nap. Establish the space as a safe and familiar place for them. I suggest even talking them through where you are and that you will be staying there. It sounds silly, but I always just try to have his perspective on life. It is respectful (at least to me) to explain everything to him so he knows we are looking out for his security and he is aware of what is happening, whether he understands or not. From the beginning we have always tried to remember he is a human and not just a thing we tote around. Sometimes we forget, but everytime I remember to take this perspective he is a happier little guy, so we figure it has some sort of validity. We figure he is seeing so many new things and experiencing so much so the more I can explain it and reassure him the safer he will feel. Making them the priority in the first 24-36 hours is very important to have an enjoyable trip for everyone. 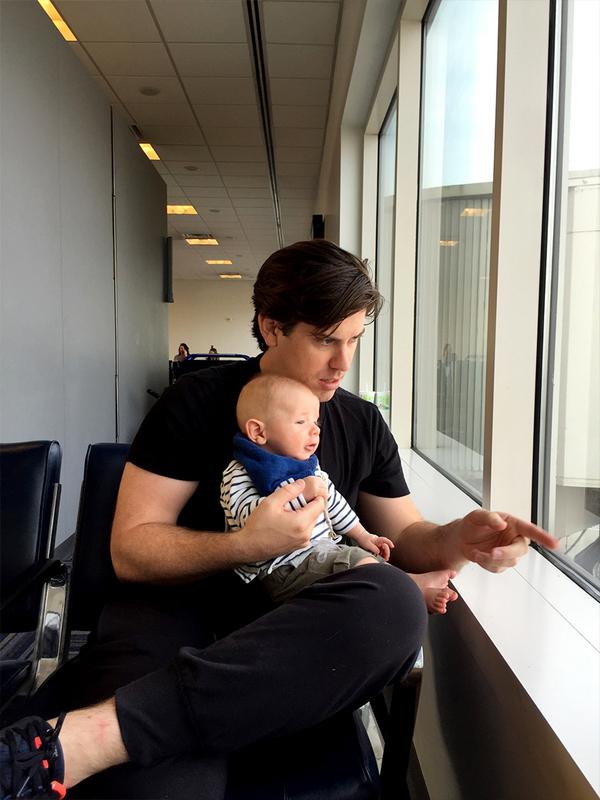 I would love to hear from you other parents how you have made traveling work for you with a little one? Is there anything I missed that maybe you have a question about?! Would love t ohear. Also, any parents who have done a longer international flight PLEASE give some tips. We plan to conquer that in the next year or so and would love to hear your tips! Really cool to see all the baby supplies. and that photo of hayes smiling with mike is everything. so cute! I used to ship gear before Leaving on our annual visit to my in laws in florida, to avoid the big haul throuGh the airport. I also bought supplies Like diapers and wipes after arriving or order them online and have them delivered to my in laws house. We usually drop the stroller altogether and just use Our baby carrier. Using it leaves me with two free hands for toting baggage, Little one Usually prefers it Because they feel safe and secure Next to me, When not in use it packs easily, and It also maKEs breastfeeding easier for me on the go. But, hey, what works for one doesn’t always work for everyone. Definitely always pack extra clothes, haha. Let me say this again, You are great parents. thanks for all the great tips! i’m just starting to worry about traveling with a baby (due in december so i’ve got loads of time) but we’re more the road trip type, less flying. Amazing article. I learned a lot of useful tips I am going to try next month on our family trip. vERY NICE TIPS! I will travel cross country in 2 days. I live in VA and am flying to CA to visit my mother in law. I AM A LITTLE CONCERNED ABOUT THE REAR FACING CAR SEAT. wE WERE GOING TO GET ONE OF THOSE CARTS, BUT NONE OF THEM FIT. sO i HAVE 2 DAYS TO FIGURE THIS OUT. tHANK FOR THOSE PRECIOUS TIPS. i WILL LET YOU KNOW HOW OUR FIRST TRIP WITH OUR 6 MONTH OLD BABY WENT. Most of your tips are spot on! I would definitely Bring baby’s birth certifIcate, though. You need it for A lap child even domestically. And i wouldn’t have packed the puj haha. It’s kind of an odd shape and there are other ways to baThe the baby. We also just use the baby carrier and not a stRoller. Glad you got to see family! Kids may need more stuffs for traveling than babies. You have to take many things for your kids entertainment books, toys and other fun stuffs. Besides a stroller is necessary for both kids and babies.